"A literate meditation on America's bloodlust for the easy fix." Rolling Stone Magazine on the movie. New York Times Book Review of 2005's source novel. And I'm still trying to figure it out. Is No Country For Old Men as deep as the vast reaches of the galaxy (with added bolt guns) or does it have the gravitas and complexity of a stripped feather (with supplemental evil thatched roof-haircut)? Who can tell? A critical smash! The ultimate Hollywood accolade (last Sunday)! But... but... Yes, two friends in the space of a few days both extolled the virtues of Cormac McCarthy's source novel ('biblical' was the word most used which didn't exactly pop my cork but biblical themes are perfectly suited to literature and movies; redemption, punishment, moral choices etc.) but I remain utterly befuddled. I liked the movie as a thriller. I'm just not sure what other layers are hidden to me that almost all other critics can plainly see. Maybe it's as simple as the movie just not being Transformers. Yes, metaphor abounds in this year's Best Film Oscar winner (from the eclectic Coen Brothers, who would have thunk it?) but is metaphor the key to this mass critical adoration of a movie fractionally removed (in story ambition) from the brothers' first, startling feature, Blood Simple? Yes, I know ninety nine one hundredths is a fraction too but allow me the 'fraction as very small amount' conceit. Did I watch it with my brain hardwired to process only a damning literal interpretation? If so, here's what all the critical and Oscar fuss is about: an unseen drug deal goes horribly wrong. A trailer park cowboy (Llewelyn? A Welsh cowboy?) 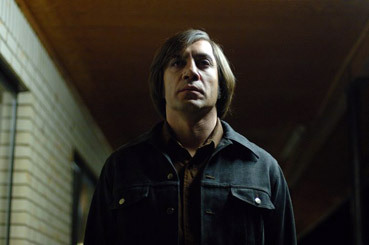 stumbles on the money abandoned in the desert and he is subsequently pursued by an insane murderous Mexican thug called 'Sugar', spelled 'Chigurh'. Popping up with philosophical nuggets and always several light years behind the action is Tommy Lee Jones, the local sherrif, who waxes rhapsodic about the good old days. Now, have I missed anything? No Country For Old Men is a very beautifully shot story of a mad Mexican assassin whose method of human disposal is peppered with pre-bolt gun firing musings about fate (oh, profound!) and serendipity. Toss a coin? Is this movie (tails) faux-profound or (heads) is it really a work of cinematic genius? That's up to you and time. Me? I fall somewhere in between. Josh Brolin plays Llewelyn, a staggeringly stupid character whose endless self-regard manages to doom almost anyone he meets and, more significantly, his loved ones (perhaps he was not to know that the man sent to recover the money had a metal endoskeleton and kills at his word and for what seems a childlike curiosity). The only time Llewelyn does anything smart is when he sits and waits for his assassin with a gun pointed at the door. It's notable that his one real act of compassion brings hell down about his ears. He's the personification of Hitchcock's MacGuffin (even though, as with most movies about human nature, it's probably actually the money), the device that makes everyone in a movie do what they do. Brolin's character's evasion of the assassin is the meat of the movie until we move into the ending, one that has caused no little stir in moviedom. No fewer than three friends have all said "Great movie, but what did the ending mean?" You'll find no spoilers in this review but I will say that as with Cloverfield and Jumper (wash my mouth out for even suggesting a comparison) there is a strong sense of "What? Is that it?" and after a good two hours, that's quite something to say. But then you figure out that the ending is supposed to make you think (heads or tails) and after the initial shock (oh, no 'head in a box' shock or 'Malcolm was dead all along' shock) you do pull up and muse on what you've just seen and there is a strong argument for supporting such endings because whenever any major film-maker goes against the grain, people like us should scream supportively until it hurts (even if we secretly think the narrative turn – or in this case, brick wall - doesn't work). Which is not my view by the way. It worked but much, much better in hindsight and for an artist to plan that kind of an effect on his/her audience and win a bloody Best Film Oscar... Is any kind of tide turning? Doubt it. "Hullo, Chigurh, what can I get ya?" "Art an' a shake." "D'ya want entertainment with that?" Yes, please.